CABLE #4 ☆ 1993 ☆ MARVEL ☆ MINT!! Cable #1 LOT *4 comics*(May 1993, Marvel) GOLD FOIL great NM- condition! 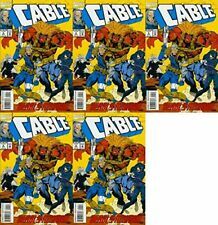 6 product ratings - Cable #1 LOT *4 comics*(May 1993, Marvel) GOLD FOIL great NM- condition! CABLE #4 CGC 9.4 BART SEARS COVER 1993, 1ST PRINT. This page was last updated: 25-Apr 09:47. Number of bids and bid amounts may be slightly out of date. See each listing for international shipping options and costs.